This chapter is intended as a first introduction to selected topics in random geometry. It aims at showing how classical questions from recreational mathematics can lead to the modern theory of a mathematical domain at the interface of probability and geometry. Indeed, in each of the four sections, the starting point is a historical practical problem from geometric probability. We show that the solution of the problem, if any, and the underlying discussion are the gateway to the very rich and active domain of integral and stochastic geometry, which we describe at a basic level. In particular, we explain how to connect Buffon’s needle problem to integral geometry, Bertrand’s paradox to random tessellations, Sylvester’s four-point problem to random polytopes and Jeffrey’s bicycle wheel problem to random coverings. The results and proofs selected here have been especially chosen for non-specialist readers. 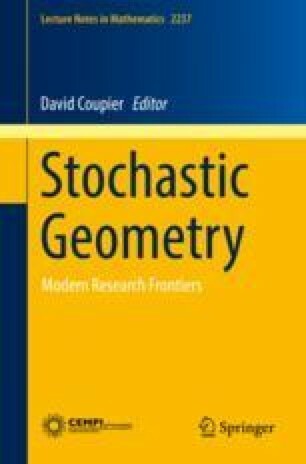 They do not require much prerequisite knowledge on stochastic geometry but nevertheless comprise many of the main results on these models. The author warmly thanks two anonymous referees for their careful reading of the original manuscript, resulting in an improved and more accurate exposition.